If you are permanently and totally disabled, then you may be applying for Social Security disability benefits. In order to receive disability benefits, you are going to have to submit an application that proves that you are disabled, as that term is defined by the Social Security Administration. Your diagnosed medical condition is going to be a very important part of your application, but it is not the only thing that will be considered. If the prescription medications that you take result in significant side effects, then those side effects should also be considered as part of your Social Security disability application. Different medications cause different side effects. While medication side effects alone are unlikely to be the basis for a successful Social Security disability determination, when those side effects are considered with your medical condition, they may be relevant to a finding of eligibility. This is particularly important if your medical condition alone is not enough to result in a finding of Social Security disability eligibility, but you need to be on medication to keep you alive or to manage your pain. Diabetes. Stomach issues, blood pressure issues, and low blood sugar levels may all be serious side effects of different diabetes medications that make it difficult for you to work. Heart disease. This is a broad category and different medications may result in different side effects. For example, one side effect could be dizziness which could prevent you from working. Cancer. Chemotherapy can leave you with significant fatigue, nausea, and physical illness that make you unable to work. High blood pressure. Many blood pressure medications have a diuretic effect. As the waste in your body is turned to water, your blood pressure may decrease. However, you may need to use the bathroom so frequently that it interferes with your work. Pain medication. Drowsiness is a common side effect of pain medications. Fatigue may be preferable to pain, but it may interfere with your ability to work. The benefits of these medications, and others, may outweigh the side effects. However, the side effects should be documented and reported so that they can be taken into account when you apply for disability benefits. 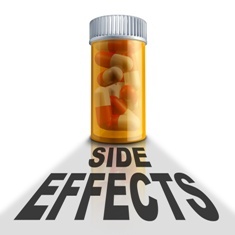 In order for your medication side effects to be considered as part of your Social Security disability application, those side effects must be appropriately documented. This should be done by your physician. You can ensure that it happens by keeping a diary of all of your symptoms, sharing it with your doctor at every medical appointment, and specifically asking your doctor to make note of it in your medical record. Additionally, your medical record should include whether there are any available alternative medications that would not have the same side effects and whether or not you have tried them. If there are safe alternative medications that are available for you then you must try them before your side effects from your current medications will be considered as part of your Social Security disability application. Medications affect people differently and the side effects that you experience are unique. Therefore, simply taking a drug that is known to have a serious side effect will not make you eligible for Social Security disability benefits. Instead, you must show how the drug is impacting you and contributing to your disability. An experienced board certified Social Security disability lawyer can help you do that. To learn more about submitting a successful initial Social Security disability application or appealing a finding of no eligibility, please contact us via this website or by phone today to set up an initial meeting with an attorney. Our legal team will consider everything that is relevant to your claim and help you get the benefits that you have earned. Should I File a Claim for Social Security Disability Benefits? Do I Need an Attorney to File for Social Security Disability Benefits?